Competency restoration is the process by which defendants who have been found incompetent to stand trial are provided treatment and education so that they have a rational and factual understanding of the legal proceedings they will encounter. 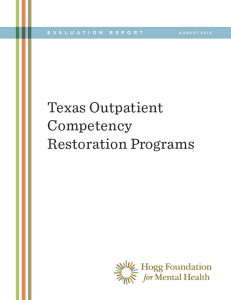 Historically, competency restoration was provided in an inpatient setting, but due to a shortage of psychiatric beds in Texas psychiatric facilities, the state began to utilize outpatient competency restoration in 2007. The Hogg Foundation for Mental Health has a strong interest in identifying potential benefits and challenges of outpatient competency restoration. The foundation, in collaboration with the Department of State Health Services (DSHS), conducted an evaluation of eleven OCR sites in Texas. In 2015, the foundation published a summary report of the evaluation’s findings.